After Philip H. Bridenbaugh became head coach of the New Castle High School football team in 1922, he soon established it as a football power. His team in his first year posted eight victories, no losses and one tie and outscored the opposition, 229-54. They went 10-0-1 in 1923 and 10-0 in 1924. Not until two-thirds into the 1925 season did a Bridenbaugh team lose a game. “Bridie’s” teams compiled a 273-63-26 record from 1922 to 1955. New Castle became one of the first high school teams in the country to play night football, in 1929, when lights were installed at Franklin Field, now known as Taggart Stadium. More than 12,000 fans crowded into stadium seats for big games in the 1940s and 1950s. Perhaps the most memorable game of the long Bridenbaugh reign came at Massillon, Ohio, in 1937 when New Castle upset the host Tigers, considered one of the strongest teams in the nation. New Castle’s 7-0 victory ended a Massillon 26 game, winning streak. The Tigers, coached by Paul Brown, then won 33 straight games, making the New Castle loss the only defeat in 60 games. In 1977 after New Castle won its 500th game, Bridie was quoted by the Detroit Free Press as saying that boys from working class families made the best athletes. “There’s no luck connected with it. Most of the players have always been from ethnic, working class families and they realized football meant a better way of life and they worked harder at the game. Bridenbaugh died in 1990 at the age of 100. 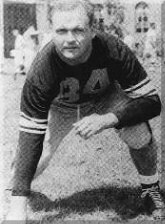 Lindy Lauro, who had thrown the touchdown pass that defeated Massillon in 1937, and then played at Pitt and for the Chicago Cardinals, became head coach of the New Castle Red Hurricanes in 1961. He quickly restored the work ethic and winning ways to New Castle football. Lauro’s teams went undefeated six years and won three WPIAL championships, while compiling a 220-104-15 record. 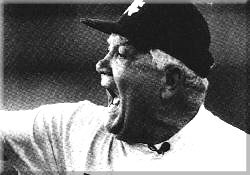 When he won his 200th game in 1987, New Castle became the only school in the country to claim two coaches with 200 or more victories. In addition, in 1987, with 605 victories, New Castle became the third winningest high school team in the nation. Lauro retired as head coach in 1992. Lawrence County has sent many football players to the nation’s colleges and universities. Some have gone on to play professionally. Three professionals have been selected for Pro-Bowl appearances. 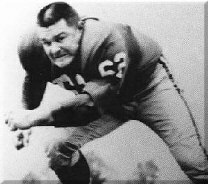 Bill McPeak, who never lettered at New Castle, but played varsity football at the University of Pittsburgh, went to the Pro-Bowl three times in his career (1949-58) with the Pittsburgh Steelers. McPeak coached the Washington Redskins (1961-64) and served in administrative capacities for the Miami Dolphins and New England Patriots. 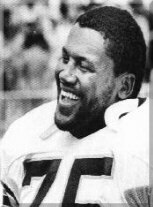 A standout for New Castle High and Pennsylvania State University, Clark went on to play pro football in Canada before coming back to this country to play for Green Bay and the New Orleans Saints. He joined the Saints in 1982 and went to the Pro-Bowl as a Saint in 1985. Darrell Dess played for Union Area High School and was an All-Conference guard at North Carolina. He played in the NFL from 1953 to 1965 with the Washington Redskins, Pittsburgh Steelers, New York Giants, and the Detroit Lions. 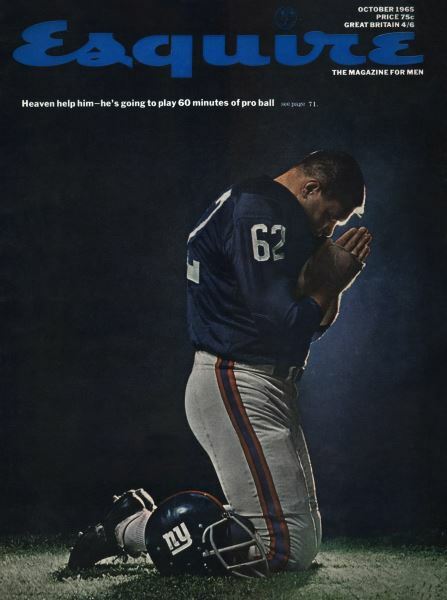 As a Giant, he was selected for the Pro-Bowl in 1962 and 1963. This Oct 1965 Esquire cover, by American art director and designer, George Lois, is part of 32 of Lois-designed Esquire covers exhibited by the Museum of Modern Art. It shows NY Giant guard Darrell Dess, in mood of a Renaissance painting, praying for survival. Photo by Carl Fischer. The emergence of Westminster as a small-college football power occurred under the guidance of Harold Burry, who 1952 took over a program that had known only one winning season in 33 years. His teams in a 20-year period ending in 1971, were 127-31-5. They had six undefeated seasons and won the NAIA national title in 1970. Burry was inducted into the College Football Hall of Fame in 1996. Following Burry, Joe Fusco coached with equal success. His teams from 1972 to 1990 had a record of 154-34-3 and won four NAIA championships. Fusco was inducted into the College Football Hall of Fame in 2001.